A shot of NGC 7479 from Whiting NJ. Gene just fell a tree that was blocking a large part of his Eastern sky. The tree was sacrificed in the name of astrophotograpy, even though Gene claims otherwise. This image was taken from a nearby patch of grass. The image is an LRGB composite for a total of 1/2 hour exposure through a 5" f7 refractor.This galaxy is also known as Herschel 55-1. 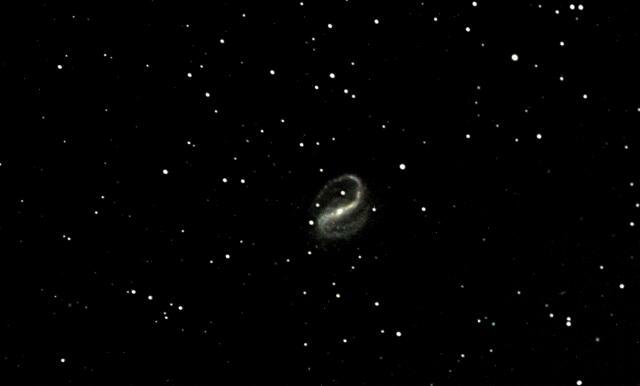 Here is a blurb from Wikipedia: NGC 7479 is a barred spiral galaxy discovered by William Herschel in 1784, about 105 million light-years away. Supernovae SN 1990U and SN2009jf occurred in NGC 7479. NGC 7479 is also recognized as a Seyfert galaxy undergoing starburst activity in the nucleus and the outer arms (Kohno, 2007 ). Polarization studies of this galaxy indicate it recently underwent a minor merger and that it is unique in the radio continuum with arms opening in an opposite direction to the optical arms (Laine, 2005).